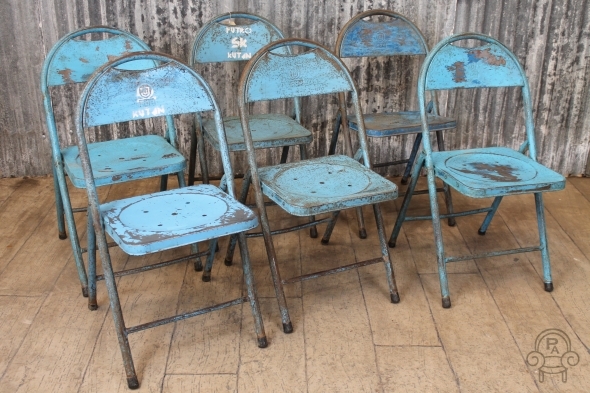 These vintage industrial folding blue chairs are a great addition to our extensive range of original and industrial furniture. A great opportunity to buy some truly authentic folding chairs with a unique look. They feature unique paintwork and spots of rust giving a truly authentic appearance. Ideal for a multitude of uses, they would be fantastic to use in any restaurant or café shops. As you can see, the seats have small holes for water drainage if used outside. Please note – this listing is for one chair only, but we do have more available. We have 100s of stacking chairs in stock in a variety of different styles, please browse our website to view the full range.